The following interview with Texas Representative John Garza one of a series of interviews conducted by VOCES Action and TexasGOPVote with members of the Hispanic Republican Conference in the 82nd session of the Texas Legislature. 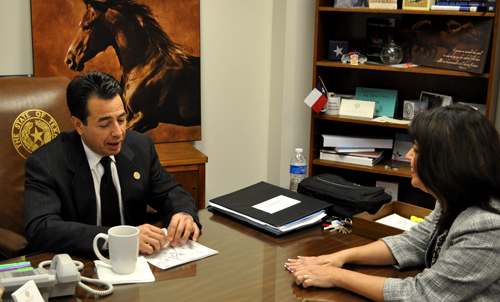 Rep. Garza is a member of the Texas House of Representatives from House District 117, located in part of Bexar County. Video and a transcript of the interview are included. I asked Rep. Garza about his values, Hispanics and Republicans, his district and affordability, education, the business community and his faith. I also asked Rep. Garza to explain to us a little bit about the House Concurrent Resolution 88 (HCR 88) and what he would like to accomplish with it since he is an author of this resolution. He explained that HCR 88 urges Congress to enact an overhaul of the immigration system to promote national security and economic prosperity. 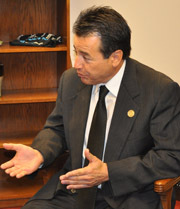 The bill was laid out before the State Affairs Committee of the Texas House of Representatives. It received a standing ovation. Rep. Charlie Geren said, "This is the best piece of immigration legislation of the session." Another Representative noted, "This is the only bill we've seen that actually proposes a solution to the immigration problem." The Resolution was voted out of the committee unanimously, 11-0, on April 19th with a bipartisan vote. The next step for the resolution is a floor debate, which has not been set yet. You can see the text of H.C.R. 88 and the action on the bill here. Adryana Boyne: We are here with State Representative John Garza. Thank you very accepting to do this interview with us. Can you tell us about your values and what shapes those values? John Garza: In our campaign, personally, in my background, I'm a businessman, I'm a father, I'm also a minister, so I wear a lot of hats and have a lot of titles. I'm also a grandfather, so the values that are important to me I think are values that communicate across many of the lines of the folks that I represent, family values are extremely important. We're also looking at the economic challenges that are being put on the families, the pressures that are being put on the families. Families are extremely important, keeping the family unit together, keeping the family, so that's extremely important to me. Freedom, the freedom to express beliefs, the freedom to express our faith is extremely important to me as well, and a lot of the reasons I came to the office was also leadership. I think it's extremely important that when we gain experience and knowledge and we take on responsibilities in business and in life, as a father, as a husband, as a manager, and a vice president, all these different positions I've held in my private life, we need to also look to the public sector to see what type of leadership is available there to represent our constituents or other families in the community that we live, and when I look at that and saw that it wasn't happening, it was a challenge to me personally, I wanted to step up and represent those values that I hold personally and dear and represent them here at the state Capitol. Adryana Boyne: I know that you are also a member of the Hispanic Republican Conference here in the House of Representatives. Hispanics will soon make 50% of the Texas population, and the future success of the Repulican Party depends on their vote. What do you suggest to attract Hispanics to the Republican Party. John Garza: It's very important to us, and I've been very involved with the Hispanic and Latino initiatives for the Republican Party, not as a title holder or any of that, but it's a concern that I have that the Republican Party needs to be more inclusive to the Latino community, to the Hispanic community, and those efforts need to be made on the grassroots level. I'm a firm believer that the platform and the values of the Republican Party are more indicative of what the values of our people are. We're very entrepreneurial in spirit, we're business owners, and the Republican Party tries to pretext businesses and allow them to be as prosperous as possible. Family, I mentioned family issues, the protection and sanctity of life or marriage being between a man and a woman, those are things that the Republican Party also stands for. Also on immigration that we deal respectfully with families and business and also security to protect the integrity of our people that are here, that are citizens or legal residents of our state, so those things are extremely important to me and they're extremely important to our Hispanic community, and I think that's something that the Republican Party needs to be very sensitive to and be very inclusive of that great growth that we're having and population growth in texas and the United States. So we're seeing that happen, so it's very positive, and it's very encouraging that these organizations, the stakeholders, the leadership is beginning to realize that, especially after the success of our elections in 2010. Adryana Boyne: I know that you are the author of House Concurrent Resolution 88, HCR 88, can you briefly explain to us this resolution and what you would like to accomplish with it? John Garza: HCR 88 was basically a proactive movement on our behalf, in our office, and also for the Hispanic Republican Conference in that we weren't going to wait for immigration issues to continue to be addressed in piecemeal fashion or incorrectly. It is a federal responsibility, it is basically a declaration that we need the federal government to handle the issues of immigration in a major overhaul because the current immigration system is extremely ineffective. It deals with the criminal aspect rather than the business aspect, and we point those out in HCR 88 that worker programs, business involvement, basically being non-discriminatory in who we're allowed to give visas and what priority that visas and work permits and citizenship is given, needs to be an even playing field, but it's a federal responsibility and we're calling on the federal government to act on behalf of the residents in Texas and hopefully we'll get 150 representatives representing the whole state of Texas declaring the federal government to get in action and be responsible for our borders here in Texas. Adryana Boyne: What is next for HCR 88? John Garza: HCR 88 currently was just passed out of committee and some of the most senior members in the Republican Party and on the Committee of State Affairs said it was the best piece of legislation that they've seen come through that committee this session. So we're excited, but what we need to make HCR 88 successful, Adryana, is just like organizations like yours and different organizations to come together and support this initiative with their local representatives. It's a very bipartisan issue, we've been talking to much of the Democratic leadership and some of the different organizations on both the Republican and Democratic sides, so that we can get a cohesive united voice in the House to the federal government that this is something that we're serious about. So the next step is to be heard and debated on the House floor, and right now, I worked hard to get all the committee members, they were unanimous in their support of HCR 88 to be released on the House floor to hopefully be debated this coming week. So if we can get as many supporters out there talking to their representatives saying this is something we all need to say in unison, the next step is really getting it approved and getting it over to the Senate. Adryana Boyne: Once the Resolution is debated, will you be willing to make some amendments, maybe in the language or something so everyone can be in more total agreement? John Garza: I think people will need to look at the resolution and read it extremely carefully because it does deal with everything in a very specific sense. Not getting into issues that maybe are maybe more political, but it's dealing specifically with the immigration opportunities as they are today in the state of Texas, but also nationwide because this is not an effort that is solely from Texas. We've had much of our input from Utah, form Arizona, and from different parts of the state as well that are equally concerned on how the nation is going to be dealt with ongoing. We're excited that we're going to hear it debated on the House floor. Adryana Boyne: Tell us a little bit about your district, what are the issues your constituents are concerned with? 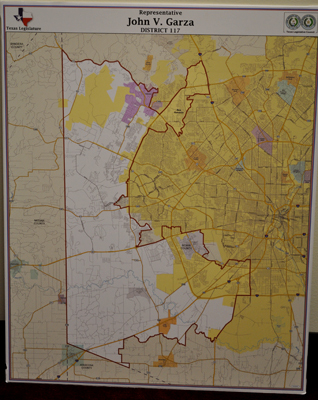 John Garza: Our district, the main concerns are affordability, housing. In my district, a large portion of affordable housing, so property taxes and the additional financial burdens being put on families are extremely concerning. Education, the ability to get the best education for our tax dollars is extremely important to our residents, and we have a thriving growing business community, and we want to keep businesses thriving and prospering and continue to bring jobs to a very young population that I have in my outlying districts, which is a high growth district, and we do have a sector of a heavily Hispanic community that has a lot of opportunities as far as basic medical care and health care, so it ranges, but education, property taxes are extremely important at keeping those low, anything that can basically help families continue to prosper. I think that's key to us being successful in our District 117. Adryana Boyne: You did mention that you are a minister, and I see you are a man of faith. I see a few Bible verses in your office as well as I saw your Bible this morning on your desk. Can you share with me what your favorite Bible verse is? John Garza: It's basically quoted several times in the Bible, and I'll paraphrase it because I never say it exactly like I should: "I would have despaired if I wouldn't have seen the goodness of the Lord in the land while I am living." So I'm very much a believer that the promises of God are here for us today while we live on this Earth and represent the very kingdom of God here on this Earth while we live. Adryana Boyne: Well we appreciate that and we are grateful for your service not only to the people in your district but to the people of Texas. John Garza: You're welcome, it's a pleasure. Adryana Boyne: Thank you very much. John Garza: Pleasure talking to you. The HCR88 resolution is the best I have heard coming from Republicans in the Texas House of Representatives. We need the FEDERAL Goverment to handle the issue of immigration and border security. Thanks to Rep. John Garza for bringing this resolution to the floor and thanks to the members of the Hispanic Republican Conference. How many people are part of this Conference? Good job Adryana! Thank you for all the hard work making these interviews and thank you for asking Rep. Garza about his faith and values. Great interview. I salute Rep. John Garza and the other members of the HRC for bringing clarity to the immigration debate. The crux of the matter is the economy and business. I hope HCR 88 succeeds in refocusing our efforts to what's really important, and politicians on both sides of the aisle can set aside divisive alternatives to the immigration issue which do absolutely nothing to resolve the problem and are mainly pursued for political expediency.